Music is an integral part of life at Hanford; no day passes without a song or some impromptu piano playing. Nearly every child plays one musical instrument and many play two. 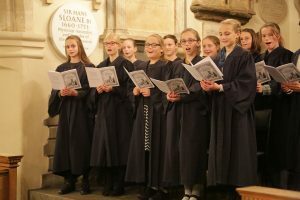 There is a choir for each year group, which any child may join, plus a Chapel Choir, to which entry is by audition. There are also flute groups, a wind band, a string group and an orchestra. 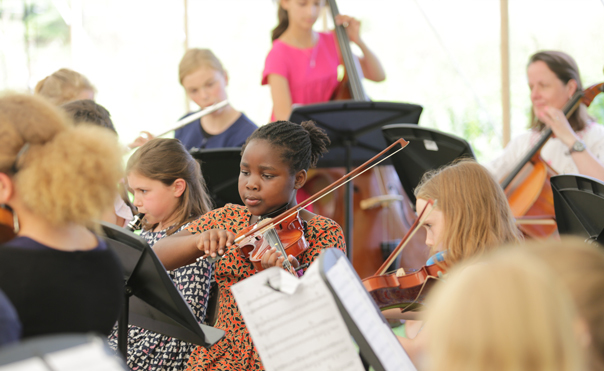 Children regularly perform for each other in informal concerts throughout the year. One of the highlights of the music calendar is the Chapel Choir performing at Chelsea Old Church at Christmas. In fact all the Christmas services are magical, taking place either in our Chapel, lit by candlelight, or in the Hall around the tree. Singing is therefore very popular but so too is learning an instrument. Hanford has a wide range of instruments on offer to the budding musician and can always find a teacher to cater for more unusual options. It is therefore unsurprising that over 90% of girls chose at least one instrument with many opting to play two. In this our Director of Music is supported by a raft of talented peripatetic instrumental teachers. On arrival girls are expected to try a couple of options before finding an instrument that they will enjoy learning. Learning to play as part of a group or ensemble is important at Hanford. As so many girls choose to learn an instrument we are able to offer a lot of different groups to join. We have an Orchestra, Chamber Group and a Wind Band. They are sometimes invited to play for garden parties and village fêtes and always perform at the end of term concert on Parents’ Day. Two or three times a year there are concerts at the school to which parents may be invited. Every child sings in the school’s Carol Service. Girls leave Hanford with a love of music that we hope will carry them through their lives.